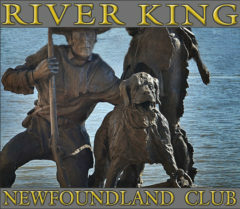 The River King Newfoundland Club is a non-profit regional organization recognized by the AKC-sanctioned Newfoundland Club of America to represent the best interests of the Newfoundland dog in south-central Illinois and east-central Missouri. An extremely important part of the Club’s mission is rescue. The purpose of the RKNC’s rescue program is to rescue unwanted or homeless Newfoundland dogs and, whenever possible, place them in good homes. RKNC’s committee works within the guidelines of the Newfoundland Club of America’s Rescue Committee. If you have a Newfoundland dog you can no longer keep, or know of a Newfoundland in need of rescue, please contact our Rescue Coordinator, Debbie Fitton, as soon as possible (her contact info is at the bottom of this page). If you know of someone with a Newfoundland they can no longer keep, please pass this information along to them. The River King Newfoundland Club Rescue Committee will accept any pure-bred Newfoundland regardless of age or physical condition, and will do so without question. We recognize that while no Newfoundlands (indeed, no dogs) should be acquired casually or disposed of lightly, sometimes an owner’s circumstances change and the Newf is no longer suited to his or her present home or circumstances. This is the point at which RKNC Rescue should be contacted. The Newfoundland Rescue Network maintains a waiting list of pre-screened adoptive homes that are interested in acquiring a Newfoundland dog, so rest assured that any dog placed with RKNC Rescue is in very good hands and will soon find a loving “forever” home.